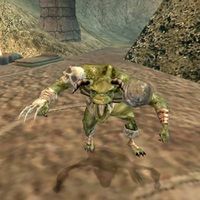 Description: The small type of goblin, with typical yellowish eyes and a hunched back, looks kind of fragile, but their crude weapons make them quite hard-hitting enemies. They often come in numbers. 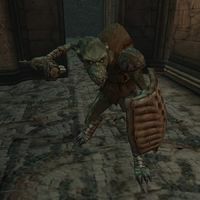 Quote: A guard in Mournhold: "Little vermin. I'd love to get my hands on some of their scrawny little necks. The people have been making a stink about seeing some around the city recently, especially in the Godsreach area. I'll keep my eyes out for them." Drops: Goblin Shield, Restore Health Potion, Random Goblin Weapon, Random Bandit Loot. 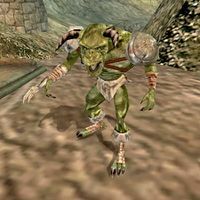 Description: The medium sized goblin often stands guard leading durzog hounds or smaller goblins. Quote: Fedris Hler: "Miserable, horrid creatures. They're vile and vicious. 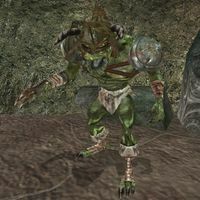 They vary in size from smaller than a Bosmer to larger than a Nord. Some are mindless animals; others have learned the ways of magic. 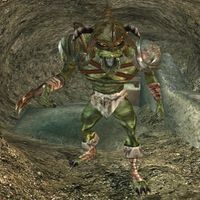 You'll often see them with trained Durzogs, another filthy creature." Drops: Restore Health Potion, Random Bandit Loot. Description: The high-ranking warchiefs are powerful warriors, impressive in sight and ruthless in battle. They cast powerful combat magic and should be treated with caution. Found: Old Mournhold: Tears of Amun-Shae. This page was last modified on 4 September 2017, at 10:48.